The ranch is a beautiful, 3 story, 3 bedroom , 2 bath home in the middle of 60 beautiful acres. Located on a large lake connecting to the St. John's River with total seclusion and privacy. This is a one of a kind vacation with all the comforts and still within 35 minutes of Daytona and New Smyrna Beaches and one hour from Orlando. Other attractions are Two Springs (20 minute drive), great restaurants, golf, snorkeling, boat rentals, fishing , scuba diving, hiking and great fishing and boating. all located near historic Deland. We also have added wireless high speed internet and a new 55 inch Sony High Definition TV with its own Movie room for evening entertainment with DVD . We also have a screened in pool with hot tub. The ranch also has a dock and boat ramp on Lake Beresford . There are springs just 4 miles down the river to visit by boat where you can picnic swim or snorkel. By boat there are miles of beautiful river and tributaries to explore or relax on the wraparound porch. The Ranch is perfect for weddings of any size, or family functions, reunions, or business events, with unlimited parking. There is a downstairs room als that can be used to set up food, dance etc. there is no other property that compares in the area. Weddings and family gatherings: no other property in the area offers the expansive property and privacy for the perfect country wedding or family gathering. 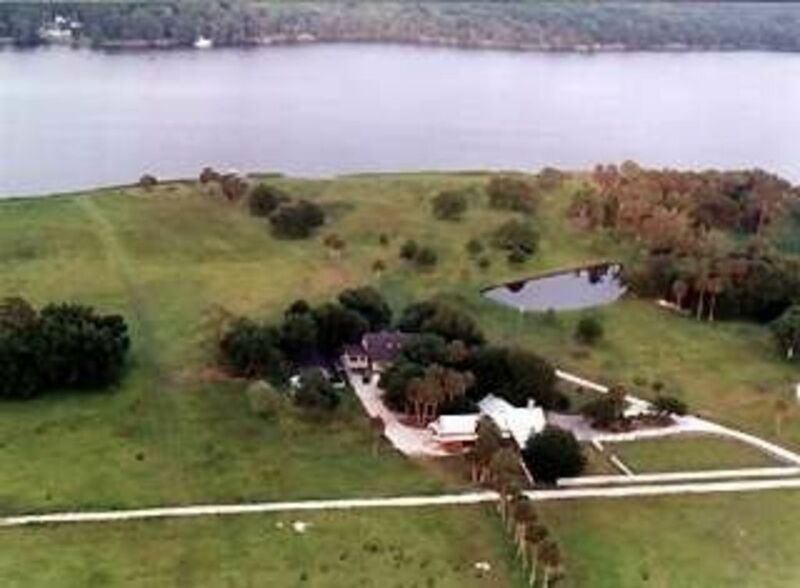 The ranch has over 1,100 feet of lakefront. Connecting to the St Johns River, with Blue Springs just 3.5 miles from our property. Bring your boat or rent one to cruise, fish or go to the springs . Great experience would definitely recommend and stay again. The house was very close to the marina we were using. We spent the week of Thanksgiving here with my parents, our two small children, and two dogs. The property is absolutely gorgeous and we would definitely stay here again. The pictures are accurate as to the decor, but the beds were comfortable, showers were great, and we ran into no issues. The house has a great porch for drinking your morning coffee and there are strategically placed benches under a tree and by the lake in order to enjoy the scenery. The house is separated into two nearly identical suites consisting of a living room, bedroom, bathroom and kitchen, which are connected by a hallway containing the washer and dryer. There are two beds upstairs as well in a single room. You feel like you are in the middle of nowhere, however you can get anywhere you need to go in minutes. I highly recommend. Great place to get away without being too far away from it all. Hosts were great. Property description accurate. Beautiful views. Our kids loved it. Our dogs loved being able to run and play. Very unique property. Everything worked properly. Highly recommend. We would like to thank Roy for allowing my family and I to stay there this past weekend. It was truly womderful. Very tranquil. We got to relax and the kids loved the pool. He recommended Deleon springs for breakfast and everyone loved it. Your home is beautiful, thank you again for everything, we enjoyed every minute spent there. Lakes, colleges, golf, boating , swimming , diving, skydiving , fishing, natural setting with 1,100 feet on the water. the most private setting you can find in Central Florida.